Duluth, MN – On Tuesday, October 14, the Duluth Model’s “Coordinated Community Response to Domestic Violence,” a partnership between Domestic Abuse Intervention Programs (DAIP), and criminal justice agencies of the City of Duluth and St. Louis County, was named world’s best policy. Out of 25 international nominations, the “Duluth Model” was the only policy to be awarded the 2014 Future Policy Award for Ending Violence against Women and Girls, or Gold Award. The Future Policy Award is the only international award which recognizes policies rather than people, and the “Duluth Model” is the first humanitarian policy to be honored in the history of the award. 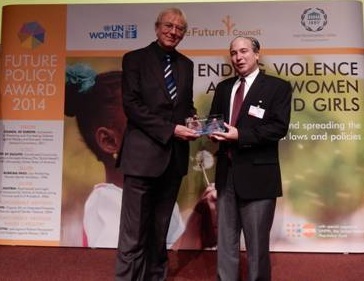 Presented by World Future Council, the Inter-Parliamentary Union (IPU) and UN Women, Representative Michael Paymar, co-founder of the “Duluth Model,” accepted the prestigious 2014 Future Policy Award for Ending Violence against Women and Girls in Geneva today. The “Duluth Model” won the Gold Award for prioritizing the safety and autonomy of survivors while holding perpetrators accountable through community-wide coordinated response, including a unique partnership between non-profit and government agencies. This approach to tackling violence against women has inspired violence protection law implementation and the creation of batterer intervention programs in the United States and around the world, including in countries such as Austria, Germany, the United Kingdom, Romania, and Australia. On November 25, 2014, the International Day for the Elimination of Violence against Women, the World Future Council and its partners, UN Women and the IPU, will host an interactive panel discussion on the preconditions of successful policy-making and implementation at UN Headquarters in New York. Policy-makers from Austria, Burkina Faso, the Council of Europe, and Minnesota, including Melissa Scaia, Executive Director of DAIP (and AFFP) and Rep. Michael Paymar, will participate.